Shahvee is an Argonian citizen living in the Argonian Assemblage outside Windhelm. She is the only female Argonian in the game that can be married but only if you bring back her amulet. Her daily routine reflects that of the other Argonians on the dockside. She sleeps in the assemblage every night between 9pm and 7am and always starts the day with a two-hour breakfast. She then heads outside and spends twelve hours at the tanning rack before her dinner at 8pm. She wears a simple set of farm clothes and carries the key to the Argonian Assemblage, an iron dagger and a selection of lower-class items and gold. 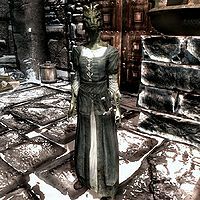 Despite the difficulties she faces in her everyday life, she maintains a happy demeanor, and will greet you with, "Skyrim isn't very friendly for Argonians, so we mostly just keep out of the way. ", "Shahvee knows the dock doesn't look nice, but fresh air is good for the gills." and "Good honest work staves off the cold." Her friendly behavior is also present when exiting conversation: "I enjoyed our talk." and "Until our next meeting, honored friend." Asking her if she always maintains a pleasant facade will have her reply with an explanation as to why she is happy with her lot in life: "Oh yes. After all, what's the point in being miserable all the time? I know life on the docks isn't easy. Sometimes life puts you in difficult circumstances you didn't choose. But being happy or unhappy is a choice you make, and I've chosen to make the best of things that I can." She will, however, admit that Argonians are treated roughly in Skyrim and that she recently lost the only item that gave her comfort. When asked about bad luck, she will tell the tale: "We have not faired [sic] well outside our native Black Marsh, but we're determined to make the best of things. I began praying to Zenithar, the god of wealth, to bring us some fortune, but thieves made off with my sacred amulet almost as soon as I bought it." If you offer to help her find the amulet, she will be grateful: "Shahvee would be in your debt, kind one." When you return with her amulet, she will be overwhelmed with joy and provide a one-point bonus to your Light Armor and Lockpicking skills, with her thanks: "Bless you, friend. You have renewed my hope. Before I came into Zenithar's calling, I confess I was a thief. But I learned a few things in my time that might help you survive. Let me show you." If Hearthfire is installed, she has no dialogue option for asking how the children are doing. This page was last modified on 28 July 2014, at 07:36.